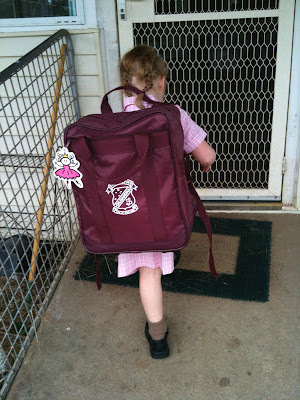 Yesterday marked the end of my Muddy Organiser’s first term at school. The end of 10 weeks of getting up, getting dressed, racing to the bus, ironing uniforms, polishing shoes, packing news, packing bank books, remembering swimming clothes and homework folders. This was her after her first day of school, rushing inside to tell Dad and her sisters about her first day! This was my Muddy Organiser arriving home yesterday – exhausted! It took me a while to wake both of them. It has been a fantastic start to her schooling life. In one term she has grown up so much and soaked up so much into her brain like a little sponge. She can now write her name without copying, count up past ten, know what comes after 50, if I help her remember 50, order her lunch from the canteen, read some sight words, read her homework readers, remember the names of almost all the 30 kids in her class plus the names of other kids in the school. My Muddy Organiser has made new friends and cemented strong bonds with old friends, she has turned from a little girl into a ‘big’ school girl. She plays more calmly with her sisters and brother, she is more polite at home and takes more care in her actions. I am incredibly proud and amazed at how far she has come in such a short space of time, so can only imagine how much more she will have learn, grown and changed by the end of the year. For now we are all exhausted, we have no plans to go anywhere for a few days. We want to recharge our batteries as well as the Muddy kids, and get some work done on our bathroom, so our house can semi go back to normal. No holidays away, just enjoying spending time at home as a family, before the chaos starts again in 2 weeks. 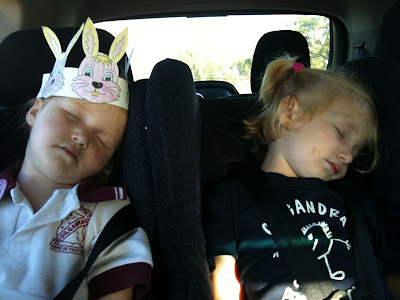 Are your kids exhausted like mine? Are you going to spend the first week of holidays staying home like we are? Or are you more adventurous? 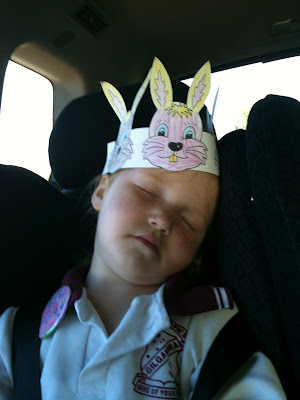 This entry was posted in Muddy Organiser, School on April 5, 2012 by nat. Oh well done Muddy Organiser… and Muddy Mama too! Sounds like an epic first term and I guess things will be a little easier to navigate second term. Cute photos of your gals, gorgeous. We’re all feeling a bit exhausted too Nat, but for different reasons, daylight savings ending is killing us… oh and molars! Oh Nat ENJOY, we still have a week to go, yes, Easter holidays AFTER Easter, dumb right?? Go ACT! !